The theology of hell, the real Edward Fudge, and stitching story lines from spiderwebs and bird spit: Donald Davenport talks to Spectrum about his new movie. The movie premiered in Houston on June 3 to an enthusiastic audience. 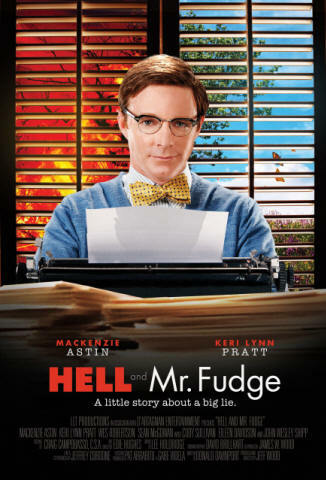 Question: You wrote the script for the movie Hell and Mr. Fudge, which recently won the Platinum Award at the Houston International Film Festival. How did you get involved with the movie? Answer: I got a call from an old producer/director friend of mine, Jeff Wood, who said there was this potential film project called Hell and Mr. Fudge and would I be willing to take a meeting about it? Naturally, I said, "Sure." We met in Los Angeles and he gave me a brief summary of what the proposed story was: A young preacher in 1970s Alabama is hired by an eccentric to research the Biblical origins of hell. At the time, I really wasn't quite sure what to make of it. I've stitched together story lines out of spiderwebs and bird spit before, but this seemed even a little more challenging than that. Not only was the real character not particularly dramatic – I mean not a fiery orator like Jonathan Edwards or a larger-than-life Martin Luther type, but instead was a rather sweet, self-effacing southerner who was fascinated by Biblical languages and looked like he could have just as easily found himself working as an Amtrak conductor as be this controversial proponent of annihilationism. The other challenge was that the process of depicting a scholar poring through various scholarly sources, trying to logically puzzle through a new paradigm, seemed particularly daunting. It was an interior journey – not some guy punching a bully in the nose – and that seemed especially hard to make work dramatically and visually. I remember that at one particular dinner meeting in Nashville, after a day of scouting locations, I told Jeff and Pat Arrabito, the Executive Producer, that I frankly didn't think I could do it. I didn't know how to give them what they wanted. It wasn't in my skill set. But Jeff was persistent and finally talked me into at least taking a shot at it. In the end, I figured that if Aaron Sorkin could make baseball statistics as riveting as he did in Moneyball, I should at least give the story of a man discovering the true origins of the commonly accepted belief in hell my best effort. And so I did. Question: Can you give us a spoiler? What does Mr. Fudge find out? Answer: Quite simply, he discovers that everyone had gotten it wrong. The concept of an eternal punishment was a "workaround" to deal with a Greek concept — originating with Plato, actually – that had worked its way into commonly accepted Christian dogma over the centuries. Specifically, the immortality of the soul. It was a concept that managed to sneak in, but once there became hugely problematic. If the soul never dies, and if that same soul is evil, it follows that the punishment must also be eternal. In other words, how do you punish something that never dies? With never-ending punishment. Granted, this is probably a laymen's gross over-simplification of some pretty complicated theological grist, but I think that's the essence of it. Why do his findings cause such a stir in his town? Edward was a very mainstream, conservative member of the Churches of Christ and for this new model for divine justice to come from a small-church pastor in northern Alabama was surprising to a lot of people. I think it was probably equally surprising to Edward as well. This wasn't some graduate student from University of Chicago Divinity School who stumbled upon this notion. This was a guy whose father had a daily radio show in Athens called, "Spiritual Guidance with Brother Fudge." Question: How do Mr. Fudge's findings in the movie gel with your own theology? Answer: My spiritual path has covered a lot of terrain, some of it on lesser traveled roads. I was always keenly aware of how certain religious traditions have used eternal torment as a handy hickory stick. I think you need only to read James Joyce's The Portrait of The Artist As a Young Man to get a good picture of that. So, I've never really felt a loving God would consign his creation, no matter how badly flawed, to eternal torment. I happen to believe that God is probably much more interested in finding ways to reconcile his creation to Him, even if it may involve some "grading on the curve." Question: The movie is based on a true story, and the real Edward Fudge is still working as a theologian and writer. Did you meet him? Answer: I did. I flew down to Katy, Texas and spent some time with Edward. I also spent time with his closest friends in Athens, Alabama. Question: How did you research the script? Answer: Jeff, and his brother, Jim Wood, had done extensive interviews with Edward and I had those transcripts. I also had access to his books, which were invaluable. In terms of capturing the regional flavor of northern Alabama, I probably had a leg up with previous book and film projects which had been set in eastern Texas, most notably the Christmas in Canaan films. I also was pretty good friends for a time with Earl Hamner, who created The Waltons, and had come to have a decent ear for that nicely educated, soft southern accent and style. And, just spending time in Athens, Alabama, helped. That said, I think Edward was rather horrified at the first draft and complained to the producers that I had the characters talking like something out of The Andy Griffith Show. I believe Jeff finally told him, "Yes, but Edward, that's how you sound." Question: My favorite line from the trailer: "Folks are partial to the truth they've already got." This seems to be a universal truth, resonating much further than 1970s Alabama. What broad lessons can we take from this story? Answer: That's interesting, because that line – and that scene – is probably my favorite in the whole film. The character, Arvid McGuire, goes on to tell Edward that you come marching in with a bright 200 watt bulb of truth and folk'll say, "No, wait, that's too much light. Folks prefer the little bitty light in the back of their refrigerator, always on when they need it, never on when they don't." Truth is, I really don't have much time for playing the "who's right, who's wrong" exercise of theological smugness. If you need to be secure in the notion that your interpretation is the right one and are willing to duke it out, you certainly have my respect but probably not my attention. Not when there are so many glaring needs to be dealt with on the human scale. Let's get 10 million hungry children fed, and then I'm happy to sit down with you and discuss hell or the 2,300 days or any of the rest of it. For now, I have to content myself with striving in my own haphazard way to understanding as clearly as I can the nature of God – the character of God. Does He love me? Does He love those that others might deem unworthy of fellowship? Does He accept my human understanding and my sincere striving to fathom the mysteries of life and purpose, or label me a spiritual miscreant simply because my conclusions are different from those of my brothers? Edward was ostracized. He was fired from his church. He was threatened. He was shunned. All because he sought the truth. In that sense, Hell and Mr. Fudge is a cautionary tale. Question: Will the movie go on general release? Will we get a chance to see it? Answer: I don't know what the current plans for distribution are. I know the desire is to try and secure a wide theatrical release, but sometimes that best way to do that is to play the film festival circuit for awhile and build up some awards and momentum. The response from WorldFest in Houston was certainly encouraging. Question: You have been writing for television for a long time. Who are some of the most interesting people you have worked with? Answer: I got to work with Vincent Price. That was pretty interesting. Working with Kenny Rogers was fun. Actually, the people that I've found most interesting are not necessarily the ones in front of the camera. I've been fortunate to work with some great producers and directors over the years. Question: I would guess that as a writer you can live almost anywhere. Why have you chosen Santa Fe, New Mexico? Answer: I'm a private pilot and back when I had my airplane, I used to fly over to Santa Fe a lot and was always struck by the beauty of the place. The organic earth forms – the sweep of the mesas, the majestic Sangre de Cristo Mountains. Plus, in Santa Fe you have world-class art and cuisine. In summer, there's the Santa Fe Opera. In winter, there's skiing and snowshoeing. Also, my agent has a second home in Santa Fe, so that hasn't hurt either. Question: Your roots in Adventism go way back. You graduated from La Sierra University, and I believe you spent some time working for Adventist organizations early in your career. Can you tell us a little bit about that, and how it's different working for an Adventist organization than a non-Adventist one? Answer: I finished my Masters Degree in English from La Sierra in 1977 and went off to work for Faith for Today at the Adventist Media Center in Thousand Oaks. It was a great learning experience, unbound by tricky things like guilds and labor unions – and one's own ineptitude. I got a chance to do a lot of different things, from writing to editing to directing and producing. It was heady stuff and we actually managed to do some very good work. The very first film I wrote, for the old Faith for Today's Westbrook Hospital series, won the Gold Medal at the Houston International Film Festival back in 1977. The irony that Hell and Mr. Fudge won its first medal at the same festival, 35 years later, is certainly not lost on me. Question: What are your next projects? Answer: I'm very excited about a couple of things. I've acquired the rights to Sally Denton's wonderful biography of Helen Gahagan Douglas, entitled The Pink Lady, and have finished the screenplay adaptation several months ago. I just learned last week that there is interest on behalf of an Oscar-winning producer to partner with us on the project and, given her credits, I couldn't be more thrilled. I also have two other projects – one being a coming-of-age feature film with a rising young actress attached and the other a small-town holiday story set in the Pacific Northwest – currently in development. And, if anyone wants to get serious about doing the definitive film version of Ellen White's life story, I'm certainly willing to talk. Question: Do you have any time to pursue your hobbies? Answer: I'm a pretty good cyclist these days as well as a pretty good chef. My wife, Carol, is a world-ranked Ironman triathlete and I'm her bike mechanic, so between all those and work, it's a rather full plate.